Brimstone Hill Fortress National Park is a UNESCO World Heritage Site of historical, cultural, and architectural significance: A monument to the ingenuity of the British military engineers who designed it and to the skill, strength and endurance of the African slaves who built and maintained it. One of the best preserved historical fortifications in the Americas, it is located on the island of St. Kitts in the Federation of Saint Kitts and Nevis in the eastern Caribbean. Cannons were first mounted on Brimstone Hill in 1690, when the British used them to recapture Fort Charles from the French. The French had not considered it possible to transport cannon up the steep and thickly wooded sides of Brimstone Hill. The construction of the fort then carried on intermittently for just over 100 years. The physical location of the fortress presents panoramic vistas of forested mountains, cultivated fields, the historical township of Sandy Point, and neighboring Dutch, English, and French islands across the Caribbean Sea. In its heyday, the fort on Brimstone Hill was known as "the Gibraltar of the West Indies," referring to its imposing height and seeming invulnerability. In 1782, the French, under Admiral Comte François Joseph Paul de Grasse, laid siege to the fort. During the siege, the adjacent island of Nevis surrendered, and guns from Fort Charles and other small forts there were brought to St. Kitts for use against Brimstone Hill. British Admiral Hood could not dislodge de Grasse, and after a month of siege, the heavily outnumbered and cut-off British garrison surrendered. A year later, however, the Treaty of Paris restored St. Kitts and Brimstone Hill to British rule, along with the adjacent island of Nevis. Following these events, the British carried out a program to augment and strengthen the fortifications, and Brimstone Hill never again fell to an enemy force. The fort was abandoned by the British in the mid nineteenth century, and the structures gradually decayed through vandalism and natural processes. Stabilization and restoration of the remaining structures started in the early 1900s, and in 1987, Brimstone Hill was officially declared a National Park. It was declared a World Heritage Site in 1999. Settled by the English and the French (who shared the island between 1627 and 1713), St. Kitts became a springboard for English and French colonialism in the Caribbean. After the native peoples were virtually exterminated, Africans were imported as slave labor on the sugar plantations. Their wealth made the Caribbean islands well worth defending with elaborate fortifications, but the scale and magnificence of the Brimstone Hill Fortress signified the importance of St. Kitts during the seventeenth and eighteenth centuries. Built between the 1690s and 1790s, the fortress became a large military community. The prominent Citadel is one of the earliest and finest surviving examples of a new style of fortification known as the "polygonal system." Brimstone Hill itself is nearly 800 feet high with steep slopes. The walls of the structures are predominantly of stone, laboriously fashioned from the hard volcanic rock of which the hill is composed. The mortar was produced from the limestone that covers much of the middle and lower slopes. During the American War of Independence against Great Britain, the French navy was assigned to assist the American cause. 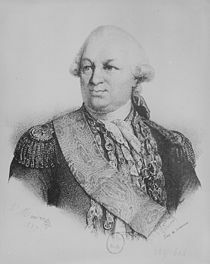 As commander of a division, de Grasse had served under Louis Guillouet, comte d'Orvilliers, at the First Battle of Ushant from July 23 to 27, 1778. In 1779, he joined the fleet of Count d'Estaing in the Caribbean and distinguished himself in the battles of Dominica and Saint Lucia during 1780 and of Tobago during 1781. He contributed to the capture of Grenada and took part in the three actions fought by Guichen against Admiral Rodney in the Battle of Martinique. He came to the aid of George Washington and Comte de Rochambeau, setting sail with 3,000 men from Saint-Dominique. De Grasse landed the 3,000 French reinforcements in Virginia, and immediately afterward decisively defeated the British fleet in the Battle of the Chesapeake in September 1781. He drew away the English forces and blockaded the coast until Lord Cornwallis surrendered, ensuring the independence of the United States of America. 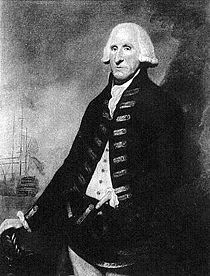 He was less fortunate, however, at the Battle of St. Kitts, where he was defeated by Admiral Hood. Shortly afterward, in April 1782, he was defeated and taken prisoner by Admiral Rodney at the Battle of the Saintes. Some months later, he returned to France, published a Mémoire justificatif and, in 1784, was acquitted by a court-martial. There is a monument commemorating Admiral de Grasse and the sailors who helped the United States achieve its independence from Great Britain at the Cape Henry Memorial, Fort Story, Virginia Beach, Virginia. It is maintained by the Colonial National Historical Park of the National Park Service. The American Revolutionary War was deeply unpopular with much of the British public and navy. Many admirals had declined to serve under Lord Sandwich, the First Lord of the Admiralty. Admiral Rodney, who then commanded in the West Indies, had complained of a lack of proper support from his subordinates, whom he accused of disaffection. The Admiralty, anxious to secure the services of trustworthy flag officers, promoted Hood to rear-admiral on September 26, 1780, and sent him to the West Indies to act as second in command under Rodney, who knew him personally. He joined Rodney in January 1781 in his flagship Barfleur and remained in the West Indies or on the coast of North America until the close of the American Revolution. The expectation that he would work harmoniously with Rodney was not entirely justified. Their correspondence shows that they were not on friendly terms; but Hood always did his duty, and he was so able that no question of removing him from the station ever arose. The unfortunate turn for the British taken by the campaign of 1781 was largely due to Rodney's neglect of Hood's advice. 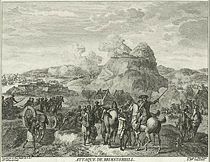 If he had been allowed to choose his own position, he could have prevented the Comte de Grasse from reaching Fort Royal with the reinforcements from France in April. When Rodney decided to return to Britain for the sake of his health in the autumn of 1781, Hood was ordered to take the bulk of the fleet to the North American coast during the hurricane months. Hood joined Admiral Thomas Graves in the unsuccessful effort to relieve the army at Yorktown, when the British fleet was driven off by the French Admiral, the Comte de Grasse, at the Battle of the Chesapeake. When he returned to the West Indies, he was for a time in independent command owing to Rodney's absence in England. De Grasse attacked the British islands of St. Kitts and Nevis with a force much superior to Hood's squadron. Hood made an unsuccessful attempt in January 1782 to save them from capture, with 22 ships to 29, and the series of bold movements by which he first turned the French out of their anchorage at Basseterre of St. Kitts and then beat off their attacks were one of the most better accomplishments of any British admiral during the war. In 1782 Hood took part in a British fleet under Rodney that defeated a combined French and Spanish fleet planning an invasion of Jamaica. The French commander, De Grasse, who had been responsible for the victory at Chesapeake, was captured and taken back to Britain as a prisoner. Hood was deeply critical of Rodney for not pushing home his victory against the retreating enemy fleet. Had they pursued, he suggested, the British might have taken additional prizes and destroyed the French naval presence in the Caribbean. Eventually Hood was ordered to chase, and he captured two ships on April 17. While serving in the Caribbean Hood became acquainted with, and later became a mentor to, Horatio Nelson who was a young frigate commander. The growth of the tourism sector has become the main foreign exchange earner for the twin-island federation of Saint Kitts and Nevis. Places of stunning natural beauty, the islands were known in the past variously as "Sweet Island" (Dulcina), "Fertile Island" (Liamuiga), and "Land of Beautiful Waters" (Oualie) by their native inhabitants. The same appreciation of nature remains today and is reflected in the law that forbids any structures to be built higher than the surrounding palm trees, and natural preservation is considered a priority. Brimstone Hill Fortress National Park is an outstanding, well-preserved example of seventeenth and eighteenth century military architecture in a Caribbean context. It is the primary cultural tourist attraction on the island. Following the terrorist attacks in the United States of September 11, 2001, tourism arrivals dropped off precipitously and activity in related sectors of the economy, such as road construction and retail sales, declined as well. As a result, the GDP growth declined substantially in 2001 and 2002. Economic activity recovered after that, mainly driven by strong growth in tourism, until a sharp drop due to the economic meltdown of 2008. In view of its high level of public debt, the country needs a prudent fiscal policy to ensure sustainable economic growth. ↑ CountryWatch, Inc, Saint Kitts and Nevis. Retrieved November 15, 2007. Camp, Jennifer B. 2006. Community Dynamics and Social Status at the Brimstone Hill Fortress National Park, St. Kitts, West Indies. Thesis (M.A. )—University of Montana. OCLC 75403442. King, G. H. 1965. Brimstone Hill, the Gibraltar of the West Indies. OCLC 21204366. St. Kitts Tourism. Brimstone Hill Fortress. Retrieved February 2, 2009. UNESCO World Heritage Centre. Brimstone Hill Fortress National Park. Retrieved February 2, 2009. History of "Brimstone Hill Fortress National Park"
This page was last modified on 24 June 2016, at 15:58.